The Client Panel is a simple, login-based admin area where your customers can download tour images, edit the tour (select music, rearrange/hide images, rename the images, add descriptions), edit the flyer, and retrieve tour links and embed codes. This is the default view after logging in and displays all of your customer's tours. You'll notice that your customers have the ability to filter their tours by state. Thisan change their Customer Record information including logos and photo. Agents can connect their YouTube channel by logging into their YouTube channel and clicking the second link on the page. Then they can follow the instructions. *If you do not wish to provide this service, view our support article here to turn this off. 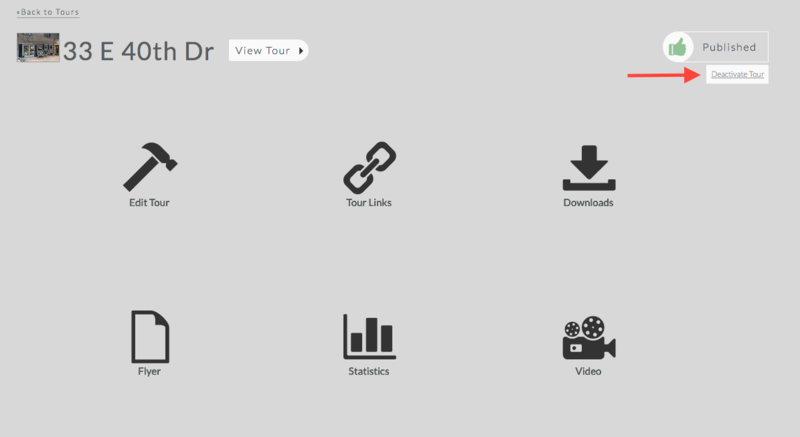 The Tour Detail view is organized around the 6 major things your customers need to access for each tour. This puts the most commonly accessed items first while still making it fast and easy for your customers to access the multitudinous features of the system. They can also deactivate the tour in the top right corner (directly under Published) at any time. This button allows you to customize the tour. You'll notice five main tabs - Address/MLS, Tour Info, Tour Settings, Media, & Media Settings. This tab allows you to update the MLS information on the property, as well as the address of property. Here you can edit tour headings 1 and 2 as well as the property description. This tab allows you to edit and add custom links, including a custom flyer, custom schools link, custom links 1 & 2 and a Matterport link. The media tab allows you to upload, and rearrange the order of media items. You can also edit media details which includes name, description, media type (image or floor plan), duration/display time, etc. On this tab, you can also make additional edits to the tour including music, image display time, transitions, panning settings, etc. Branded Tour - Complete with provider and customer branding. Not suitable for most MLS/IDX Systems. Unbranded Tour - Suitable for most MLS / IDX systems. Simple Layout Tour - A minimalist layout with nothing but the viewer. No branding, no links, just images. (Only applies to older designs). Gallery - A non-tour version of your images in a simple gallery-style view. From the Client Panel, your customers can download images in Small, Large, Print-Quality, and an "MLS" size. *MLS sizes only appear if MLS information has been added to the tour and if we have the proper image size requirement for that MLS. Images and text can be customized. View statistics for your tour which includes total photos viewed, total tour views, total visitors, referring sites, and repeat visitor information. The statistics on this page are update approximately every 30 minutes. Add additional email addresses to receive weekly statistics, update frequency of statistic emails, or disable/re-enable statistic emails. Allows your customer to request a video version of the tour in a single movie file (.mp4) suitable for use on YouTube, DVD, etc. You will receive an email when your customer has requested a video. Please note, they are not allowed to actually order the video as there is a charge for this - you must complete the order on their behalf. Once the video has been created it will be available for download or direct upload to Youtube in the Client Panel. Your customers do have the ability to regenerate their video should they need to make changes to the tour. If you do not wish for your clients to have access to this, follow the instructions here to turn this option off. The provider determines what level of access the clients control. Your customers can now access all of their tours from a single Client Panel login.